Rinse fruit under cold running water, then drain off water. Using a #8 scoop, portion ½ cup cottage cheese in each container. Add ½ cup fruit (or 1 whole fruit), and 1 muffin loaf to the container. Portion fruit, cottage cheese, and muffin for each serving. Each portion provides 2 oz. eq. meat/meat alternate, 1 oz. eq. whole grain, and ½ cup fruit. If other fruit is served, refer to the USDA FNS Food Buying Guide for School Meal Programs to determine the serving size required to meet the daily fruit component requirement.Crediting is based on fruit listed iningredients. If other types of fruit are offered, the nutrient analysis must be recalculated. Garnish cottage cheese with one half maraschino cherry or creatively arrange fruit around cottage cheese. 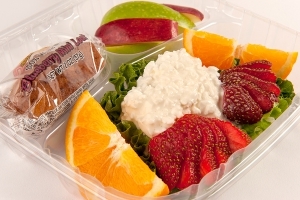 A container allowing space for the salad, cottage cheese and muffin is recommended. Clear plastic lid for eye appeal is preferable. 1 serving of Fruit and Cottage Cheese Salad.